Three Areas of Photography to Conquer Technical Quality Dramatic Appeal Photo Composition By Susan Duncan Pine Tree High School. 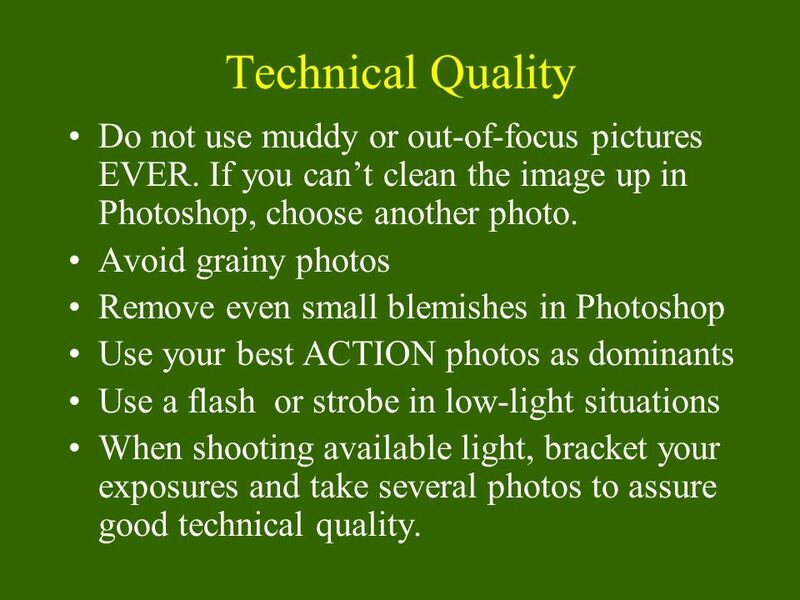 2 Technical Quality Do not use muddy or out-of-focus pictures EVER. If you cant clean the image up in Photoshop, choose another photo. Avoid grainy photos Remove even small blemishes in Photoshop Use your best ACTION photos as dominants Use a flash or strobe in low-light situations When shooting available light, bracket your exposures and take several photos to assure good technical quality. 3 Dramatic Appeal WHAT IS IT? Tell a story with your photo Show action Display mood HOW DO I DO IT? 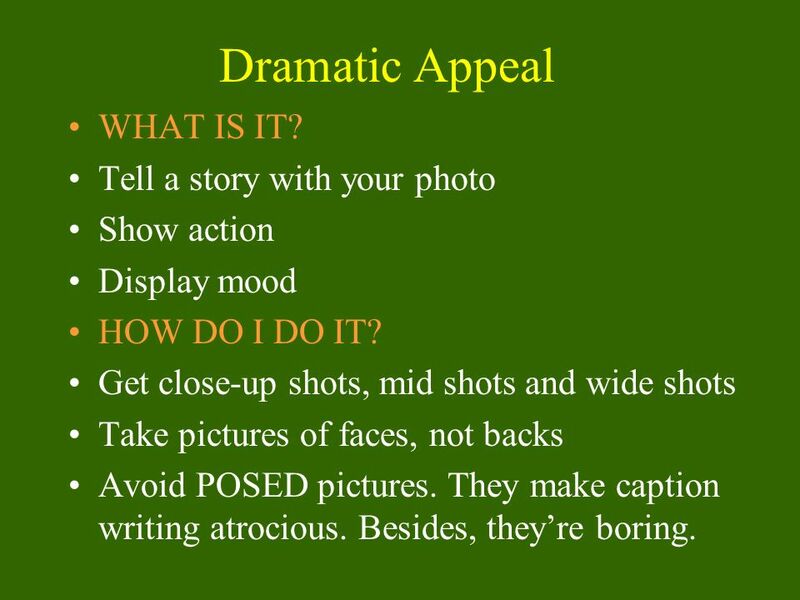 Get close-up shots, mid shots and wide shots Take pictures of faces, not backs Avoid POSED pictures. They make caption writing atrocious. Besides, theyre boring. 4 Photo Composition Use the rule of thirds Look for textures, patterns Look for leading lines Frame the subject Move CLOSE Create interesting angles Use a shallow depth of field to get rid of a busy background Look for a strong center of interest Use the quality and direction of available light to create interesting composition. 6 Tips (cont) 6. Pay attention to backgrounds. 7. Use throw-away cameras to expand coverage. 8. Shoot five times as many photos as you think youll need. 9. Develop a filing system, and stay current. 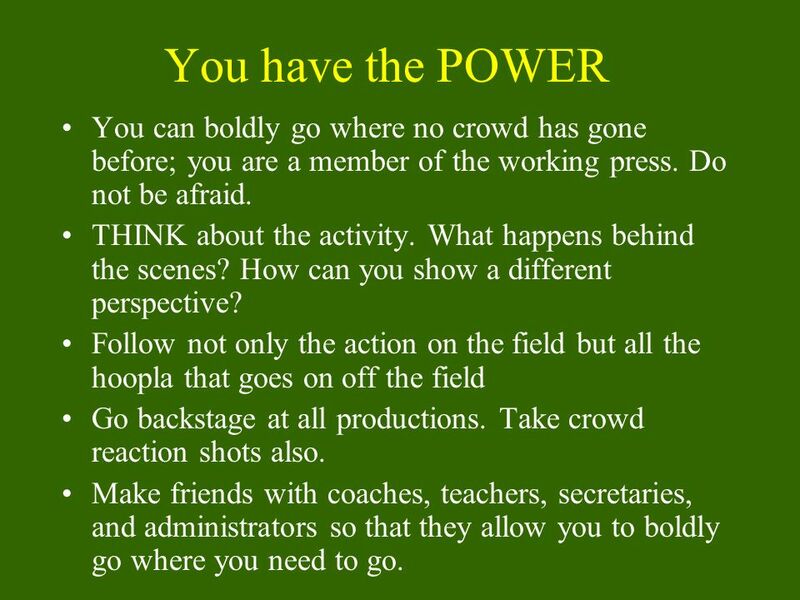 8 You have the POWER You can boldly go where no crowd has gone before; you are a member of the working press. Do not be afraid. THINK about the activity. What happens behind the scenes? How can you show a different perspective? Follow not only the action on the field but all the hoopla that goes on off the field Go backstage at all productions. Take crowd reaction shots also. Make friends with coaches, teachers, secretaries, and administrators so that they allow you to boldly go where you need to go. 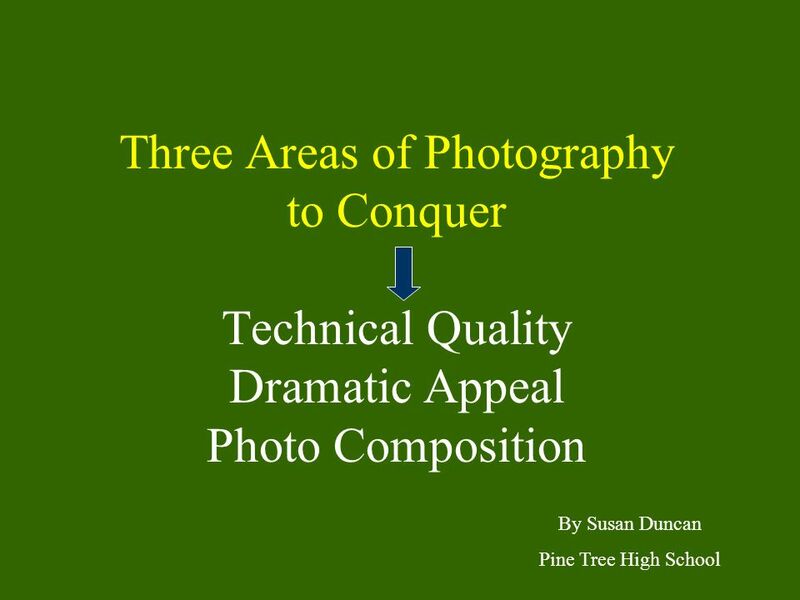 Download ppt "Three Areas of Photography to Conquer Technical Quality Dramatic Appeal Photo Composition By Susan Duncan Pine Tree High School." Creative Inventions and Robotics Digital Photography. PowerPoint Fair Use Agreement Please feel free to use this presentation with students or faculty members. 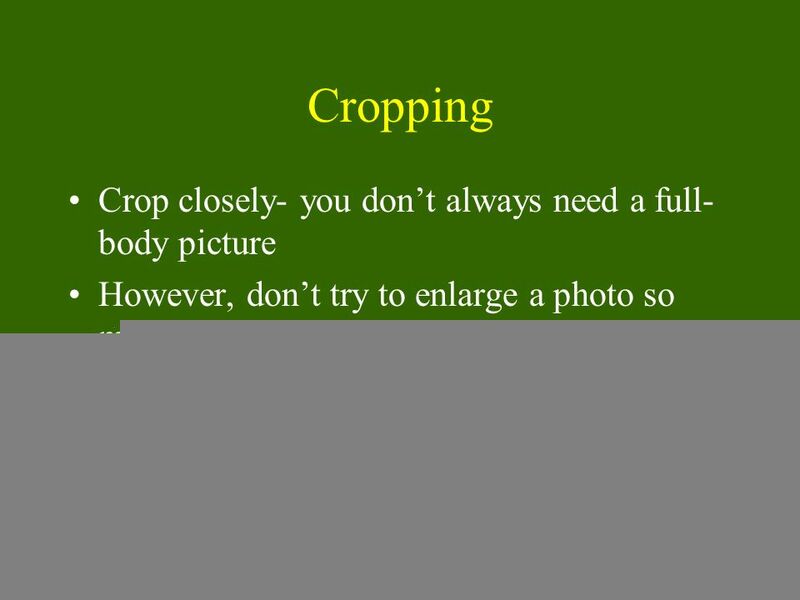 The pictures included in this presentation (with. An Idiot’s Guide to Exposure a.k.a. John’s Guide to Exposure. INF1090 Special Project Photography. It’s just taking pictures, right? Photographers have a lot to think about when taking photographs. Professional photography. For People That Like Fish Tanks Content, Design, Photos - Joshua Gunder. Composition Techniques Composition deals with the arrangement of subjects & directing the viewer’s eye through your image. Aperture and Depth of Field. APERTURE (F/STOP) 1.What is it? 2.Where is it? 3.What does it do? 4.When do you use it? 5.Why would you use F/2.8? 6.Why. Pixel Power: Getting the Most from Digital Photography. 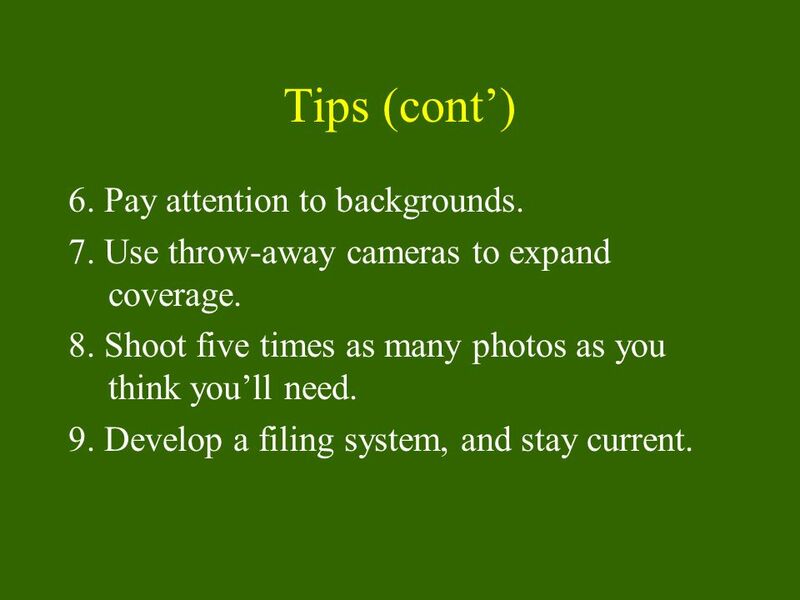 Basic Photography for Yearbook Students. Understanding Your Camera. Aperture and Depth of Field. Review What are the three controls on the camera that control proper exposure? Digital Photography. ISO Light Sensitivity. 4 Things that affect your pictures… ISO Aperture Shutter Speed LIGHT. 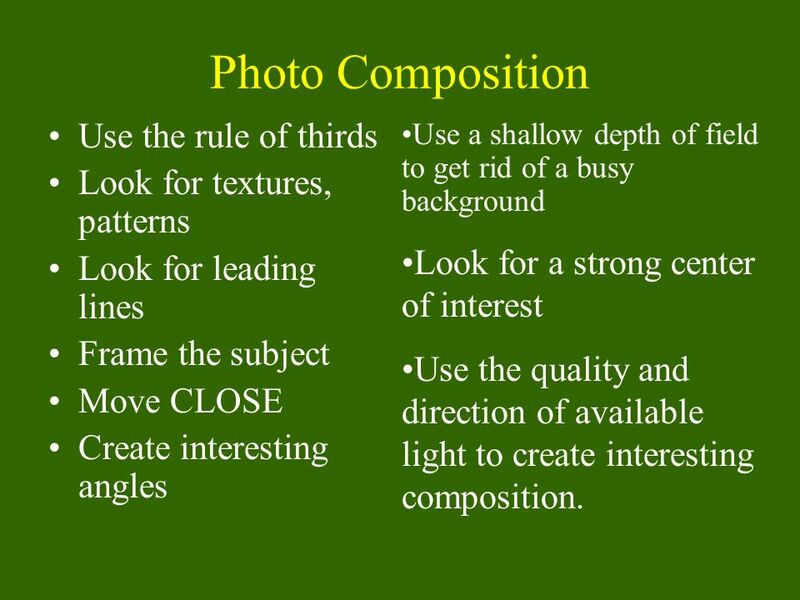 BasicsEdgeBook Curriculum Basics of Photography. 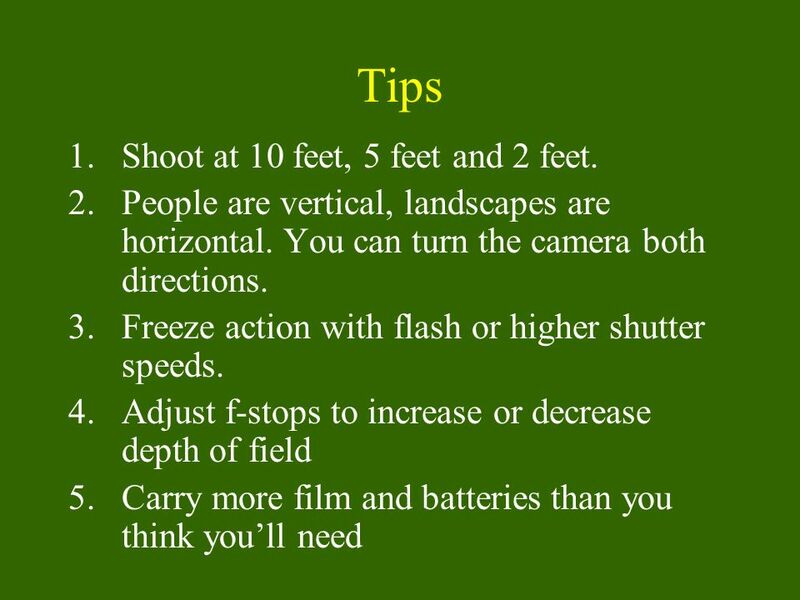 BasicsEdgeBook -Types of cameras -Megapixels -Camera settings and use -Trouble shooting -Exposure and. Photography is the art of capturing light. Every choice that a photographer makes when taking a photo is based on this simple concept. What is photography?